Museum Mike popped round over the weekend. We chatted updates on Jurassica (mind-blowing 3D technology, fundraising dinners & various other dinosaur-esoterica) and the imposter sensation of never feeling grown-up enough to be doing what you are doing – though I notice a glass of wine does seem to banish much awkward, debilitating doubt. (“That is why I force myself to drink as much wine as possible,” emailed a friend when I mentioned this to him). I also opened a couple of bottles. 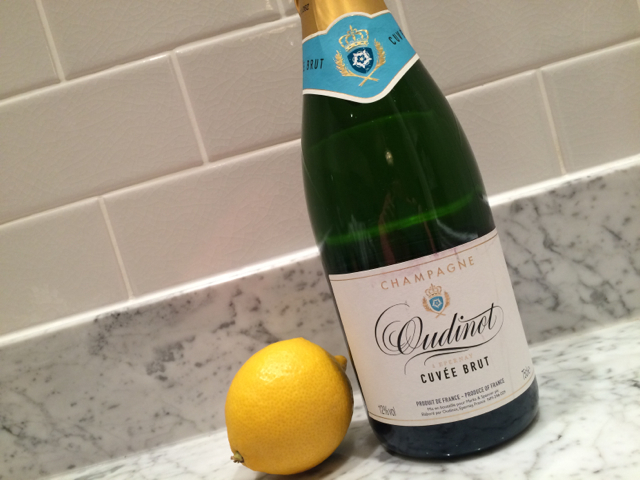 One of them was the Oudinot champagne that has been a staple in M&S ever since I can remember. I did not used to be a fan, finding it a bit thin and overly lemony. Over the past couple of years I have been won over. It has got better. It still has a strong lemon brightness, but in a good way. It’s not complicated or fussy. It sweeps cleanly through your mouth in a brisk, toasty arc: contemporary and primary. I had made saffron and yoghurt chicken kebabs, flash-cooked under a blazing hot grill so that they charred. It was good with those but even better with the very salty skinny-cut oven french fries of which I ended up making two trayfuls. A treat of a casual meal. It gets better. The champagne goes on offer on Tuesday, reduced from £25 a bottle to £15. And finally, apologies for the long radio silence. This is mostly a consequence of spilling a cup of lemon verbena all over my laptop a couple of weeks ago. Let’s draw a veil over the nasty details and just say it has taken quite a while to catch up.